The Father of the Chicken Nugget: Robert C. Baker was a poultry savant. But his contribution to fast food has been erased from the history books. We think we know the chicken nugget: small, salty, and spongy, derided by Michael Pollan and reviled by Jamie Oliver, who recreated them on camera by whizzing a chicken in a food processor and forcing it through a sieve. We know that children adore them, that parents are conflicted about them, that public-health campaigners despise them for sparking an epidemic of obesity. We know we can’t get away from them: There are nuggets at almost every fast-food chain, on almost every restaurant kids’ menu, and in almost every supermarket freezer: breaded or naked; fried or grill-marked; gluten-free or organic; shaped like alphabets, dinosaurs, or stars. We know almost everything about chicken nuggets, except who is responsible for them. 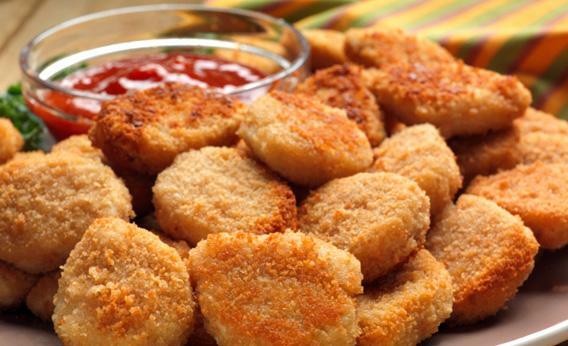 Credit, or blame, usually goes to McDonald’s, which sold its first McNuggets in 1980. But the probable inventor of the nugget is a Cornell University professor named Robert C. Baker who died in 2006, and who proposed a prototype—a frozen, breaded “chicken stick”—in 1963. The accepted history of the chicken nugget is told, with slight differences, in The Omnivore’s Dilemma, Fast Food Nation, and Behind the Arches, a 1986 chronicle of McDonald’s that the corporation cooperated with (and sent me, when I asked them for comment). The origin story goes like this: McDonald’s began with burgers, of course. But in 1977, the federal government’s first-ever dietary guidelines urged Americans to eat less fat, and especially less red meat. Burger sales dropped, and McDonald’s began looking for an alternative that would keep customers loyal. Its executives thought their best chance lay in chicken, the lower-fat protein that Americans were choosing instead, and the company plunged into intense product research, even hiring a European chef who had cooked for the Queen of England to contribute ideas. Test customers spurned one attempt, an experimental chicken pot-pie; the next idea, bone-in fried chicken, veered too close to the existing menu at rival KFC. McDonald’s founder Ray Kroc ordered the chef, Rene Arend, to work on yet another product—deep-fried onion chunks, easier to mass-produce than rings—but was countermanded by the company chairman, Fred Turner. Turner still wanted something made from chicken, and he steered the chef to chicken chunks instead. Arend boned a chicken breast, cut it into small pieces, battered and fried the bits, and served them with a sauce. They were a hit within headquarters, but too labor-intensive to make on an industrial scale. McDonald’s recruited corporate partners into a secret development campaign, calling on frozen-hamburger supplier Keystone Foods to mechanize chicken-chopping and fish-stick popularizer Gorton’s to perfect a coating that would cling. McNuggets debuted without advance warning in 15 Knoxville, Tenn., McDonald’s restaurants in March 1980 and blasted through the stores’ sales records. Word of the new product spread so quickly among franchisees that Keystone built a processing plant in 100 days to keep up with the expected demand. When they rolled out nationwide in 1981, McNuggets became a cultural juggernaut. What this story leaves out is that, 18 years earlier, Baker had come up with the same concept, for different reasons. Baker grew up on a small fruit farm a few miles from Lake Ontario, and seems to have planned to go into the family business: His bachelor’s degree, from Cornell, was in fruit agriculture. He aspired to be a Cornell professor, but his widow, Jacoba, remembers his mentors advising him to work somewhere else first. He took a position as a cooperative extension agent—a liaison between land-grant universities and local communities. After earning a master’s in marketing at Penn State, Baker went to Purdue University for a Ph.D. in food science. He joined the Cornell faculty in 1949, and set up a poultry-products technology lab 10 years later. At the time, poultry farmers were stymied. The need to feed troops during World War II had spurred reorganization in the industry, as well as improvements in chicken genetics and feed—all of which increased the amount of poultry that farmers could raise. After the war, the ability to produce birds remained high, but demand dropped. Homemakers were less interested in buying them than the military had been, because for a home cook, chickens were inconvenient. They were usually sold whole, though some store butchers would cut them up to order, and they were usually cooked by oven-roasting or pan-frying. Those methods were either time-consuming or messy, and a bad fit for the schedules of women moving into postwar office jobs. Steve Striffler, an anthropology professor at the University of New Orleans who wrote a history of chicken production, says that because chickens weren’t sought after, prices slid so low they began to undermine the industry. The industry needed to do something to raise poultry’s desirability. What, exactly, wasn’t obvious. Enter Baker. The first experiments to emerge from his basement laboratory in Cornell’s Bruckner Hall involved making eggs more attractive: He marketed small ones as a treat for children in a “Kids Pak Egg Carton” and trialed an extra-eggy frozen French toast. Then he turned to chicken, making hot dogs, canned hash, and frozen meatloaf out of hens too old to lay eggs. He market-tested each thoroughly, varying the packaging, introducing the products into local stores with and without advertising, and measuring sales as weeks went by. Baker’s prototype nugget, developed with student Joseph Marshall, mastered two food-engineering challenges: keeping ground meat together without putting a skin around it, and keeping batter attached to the meat despite the shrinkage caused by freezing and the explosive heat of frying. They solved the first problem by grinding raw chicken with salt and vinegar to draw out moisture, and then adding a binder of powdered milk and pulverized grains. They solved the second by shaping the sticks, freezing them, coating them in an eggy batter and cornflake crumbs, and then freezing them a second time to -10 degrees. With trial and error, the sticks stayed intact. Baker, Marshall, and three other colleagues came up with an attractive box, designed a dummy label, and made enough of the sticks to sell them for 26 weeks in five local supermarkets. In the first 6 weeks, they sold 200 boxes per week. Baker never made any money from the billions of nuggets that have been sold over the past three decades. By the time he died in 2006, his connection to them had mostly been forgotten, and only a few obituaries noted it. Even at Cornell, he is best-known for a barbecue sauce that is a staple of firehouse fundraisers; every summer, his daughters run a much-loved barbecue stand at the New York State Fair where “Cornell chicken” is their most popular plate. Baker’s family prefers to think of him as someone who did his job thoughtfully and with pride, and who could not have predicted the consequences. We changed the students’ names and images for privacy reasons. i completely agree with this paragraph “We know we can’t get away from them: There are nuggets at almost every fast-food chain, on almost every restaurant kids’ menu, and in almost every supermarket freezer: breaded or naked; fried or grill-marked; gluten-free or organic.” It is crazy that you can get chicken nuggets any where . I just recently went to a Chinese restaurant and they had chicken nuggets!A Chinese restaurant is meant for Chinese food!NOT CHICKEN NUGGETS! My mom and other members of my family refuse to eat McDonald’s chicken nuggets. At first I couldn’t understand. All I knew was they were yummy, and good to have every once and a while. But then I saw this and started to figure it out. What is concealed in the “bread” crumbs, and “chicken” may not be exactly what we expected. I now am going to follow in my family’s footsteps and try not to eat any chicken nuggets, because now I know what’s inside. what is pink paste? well its basicly cow tunge and other meat parts put together into a grinder and then grinded it up into this mush which is pink paste. its not even made of chicken only 1% of it is chicken. (Jan 13 2017 1:07PM) : Jacob, you said it wasn’t made of chicken but then you said one percent was. So it is made of chicken?